Ampelmann, the global provider of offshore access solutions, has supported the offshore crew change market with more than 180,000 offshore workers transferred safely to date – 100,000 this year alone through its innovative offshore marine crew change solutions. Although a little amount compared to nearly four million transfers Ampelmann has supported in total, this particular segment is growing rapidly. The company operates a number of motion compensated gangway systems which have been developed specifically for crew change operations in the Middle East, Gulf of Mexico and Asia Pacific regions. 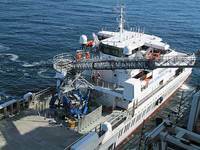 The company has already deployed three gangways for dedicated crew change projects. Two in the Caspian Sea off the coast of Baku since 2015 and one in the Middle East of the coast of Dubai in 2017. Ampelmann’s crew change solutions including the A-type, L-type and newly introduced S-type gangway system are a safe, reliable and more cost-effective alternative to helicopter and swing rope transfers. “A key factor for this is poor helicopter safety statistics and an increasing pressure on OPEX due to the ‘lower-for-long’ oil price levels. We have already successfully transformed three operators’ operations from helicopter to marine-based crew change solutions in the last two years,” van der Tempel adds. Ampelmann’s commitment to innovative personnel transfer systems resulted in the development of the S-type gangway this year, produced specifically for the crew change market. Scheduled to start production in 2018, the system is designed to be fully integrated into large, high speed vessels for long-term crew change operations. For the global oil and gas market where volume of crew is high and the sea state can be severe, the S-type can continuously transfer 50 people and luggage in five minutes in significant wave heights of up to three metres Hs. Due to the innovative design of the compensation technology it offers vessel owners a huge energy saving of up to 50% compared to Ampelmann’s current gangway systems. Ampelmann’s L-type gangway also has a proven track record in the global oil and gas market and has successfully transferred more than 130,000 offshore workers to date. The system allows a continuous flow of personnel from vessels to offshore structures and is particularly suitable for smaller crew change vessels such as Crew Boats and Fast Support Intervention Vessels (FSIV). The L-type offers a 30% reduction in cost compared to other transfer methods such as swing ropes, basket transfers and helicopter operations. Celebrating its 10-year anniversary this year, Ampelmann launched the A-type, the first full active motion compensation access system, commercially in 2008. The A-type has completed more than 110 projects worldwide, transferring more than two million globally and almost 500,000 personnel to date in the Middle East.